i don't have much time right now, i'm not even listening to any music. we just got back from MegaCon and now we're headed right back out to Awesome Con in DC! so i'll post pics and stuff from all these shows when i finally get done next week. but if you're in the area and plan on attending the convention, come out and say HI to me and my studiomates. 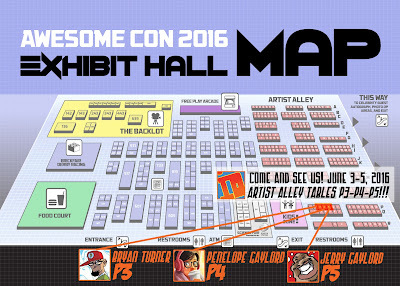 i will be at ARTIST ALLEY TABLE P4 - next to the Kid Zone and between IDSTUDIOS guys Flash at P3 and theFranchize at P5. here's a handy map to find us! hope to see ya'll there!! !